This chapter is a synthesis of new knowledge, procedures, best practices and references for collecting plant diversity since the publication of the 1995 volume Collecting Plant Diversity: Technical Guidelines, edited by Luigi Guarino, V. Ramanatha Rao and Robert Reid, and published by CAB International on behalf of the International Plant Genetic Resources Institute (IPGRI) (now Bioversity International), the Food and Agriculture Organization of the United Nations (FAO), the World Conservation Union (IUCN) and the United Nations Environment Programme (UNEP). The 2011 update of the Technical Guidelines, edited by L. Guarino, V. Ramanatha Rao and E. Goldberg, has been made available courtesy of Bioversity International. There are increasing initiatives to collect DNA for conservation, either as a “back-up” to traditional ex situ collections, such as seed and tissue genebanks, or as samples generated from the application of genetic and genomic tools. A few concerted efforts have been made and nowadays DNA banks are not just in-house initiatives: some are open to hosting samples from different origins. Conservation of DNA is still a new way of collecting genetic resources, and the development of standard procedures is happening slowly. This chapter annotates key references that summarize the most up-to-date procedures and protocols for collecting DNA for conservation. Of all the types of material collected for conservation of diversity, DNA is undoubtedly the latest and likely the last. In the late 1980s molecular studies started an era of expansion, and soon conserving DNA for future research was identified as a sensible undertaking, given the cost and time involved in extracting DNA, no matter the project. Tests of viability of DNA samples kept at different temperatures and in different storage solutions were done routinely to ensure that further research, late verifications and even exchanges with collaborators would be possible. Then, in the early 2000s conserving DNA in general became an activity in itself. After traditional collections of genetic resources, DNA banks provide a new resource for the ready availability of DNA with great potential for the characterization and utilization of biodiversity. The DNA molecule contains all the information necessary to make up any plant, but conserved DNA is not a direct resource for conservation, as DNA alone cannot contribute to the regeneration of biodiversity as seeds and other tissues can. The objectives of DNA collections are diverse. DNA is kept as a by-product of ongoing research and as the foundation of future research. DNA serves the study of the origin and evolution of species (including the effects of environmental factors). It helps in understanding biodiversity and analysing phylogenetic relationships. It complements taxonomic studies and helps define biodiversity conservation strategies. And it contributes to the investigation of population dynamics, and acts as a resource for biotechnological applications, among other things. The scope of the Technical Guidelines, as published in 1995, was restricted to collecting material, but the conservation of DNA for banking, in addition to collection, involves operations such as extracting, storing, documenting, analysing and exchanging. Also, a DNA collection may include much more than just raw DNA: a DNA collection may store tissues, and DNA in the form of genetic and genomic resources, which are “identified” DNA sequences. Similar to conventional collections, all DNA collections require the establishment of good practices and methods. However, because setting up DNA banks is a recent phenomenon in the conservation of genetic resources, collecting procedures for the development and maintenance of DNA banks are only slowly being documented and improved. Generic advice for collecting plant material for DNA extraction and conservation is basically similar to that for plant tissues in general. Distinctive and essential advice for collecting material for DNA conservation is that the material must be high quality to guarantee good extraction, and the associated information must be correct and adequate. For a very recent and complete publication on collecting for DNA banking, see Gemeinholzer et al. (2010). This paper gives guidelines for all the tasks required for pre-DNA isolation of samples, from both plants and animals. It includes information about sampling strategies, methodological considerations for collecting different types of plant tissues, strategies for tissue preservation and DNA isolation in the field, relevant logistics and safety considerations in the field, labelling of samples and recording essential information, transportation practices from the field to the laboratory and necessary equipment. Preserving DNA samples both in the field and in the DNA bank, standardization of DNA quality and characterization, and hosting sample information is thoroughly covered by Walters and Hanner (2006). A complementary publication on collecting DNA for conservation is the comprehensive review by Hodkinson et al. (2007). This paper contains information on collecting material – including the preparation of associated vouchers or maintenance of living collections, tissue banking as DNA-rich material, a compilation of DNA extraction methods, assessment of DNA quality and quantity, DNA storage conditions, documenting DNA banks, and considerations for DNA exchange. In view of the delay observed in the development of procedures for DNA collection, the authors claim that DNA banks should be integrated with other collection initiatives, such as botanic gardens and seed and genetic resources in general, which have developed appropriate protocols for curation and documentation. With this in mind, they review and illustrate DNA curation and management practices, following the different steps of bank operation. Simple recommendations are summarized on the web page of the Department of Molecular Biodiversity and DNA Bank of the Botanic Garden “Viera y Clavijo” of the Canary Islands (www.bioclimac.com/mbdna/index.php?option=com_content&view=article&id=128&Itemid=220). It contains tips to set up a DNA bank, which cover the entire DNA banking operation: collecting and organizing samples, extracting and storing DNA and sample-exchange procedures, including a link to an example of sample-management policy. No matter the advances in DNA conservation, there are challenges – technical, infrastructural and legal – to be resolved for this conservation approach to become widespread and to benefit the genetic resources community from north to south. From a technical point of view, the cost of DNA extraction and the consistency in obtaining high-quality material continue to be important limitations. 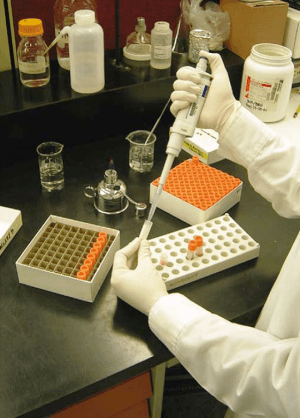 While problems of consistency can largely be solved by the use of commercial kits amenable to different types of species and tissues, the cost of the extraction per sample remains the highest among collecting operations. DNA extraction protocols that allow preservation at room temperature are extremely important, as they remove the necessity of equipment for cold storage. In developing countries, an added challenge is not only the availability of the appropriate infrastructure – including bioinformatics – but also the maintenance of that infrastructure, which is often the main obstacle to setting up a DNA bank. Perhaps it is because of the costs related to the infrastructure that developing countries lag behind in DNA conservation; however, regional collaborative initiatives could overcome some of these difficulties (Ebert et al. 2006). Therefore, an effort to communicate with the scientific communities in these countries could help to close the gap. DNA storage has advanced in the private sector, where infrastructure and capacity – including funds – are optimal (Andersson et al. 2006). This could also be an indirect result of the legalities involved in DNA exchange, with issues pending in the public sector being much less relevant in the private sector. Legal issues related to collecting, conserving and exchanging DNA are complex, perhaps even more complex than those that affect genetic resources in general. Graner et al. (2006) provide a simple account of ownership and intellectual property issues, both for DNA held in trust in a collection and for its products, following the International Treaty for Plant Genetic Resources for Food and Agriculture and the Trade Related Aspects of Intellectual Property Rights agreement of the World Trade Organization. In spite of several areas of confusion, current DNA banks are routinely exchanging DNA, taking care to observe the legal issues by using material transfer agreements. Last, but not least, issues related to data standards, data curation and information retrieval and exchange are also pending. In the end, it is not the DNA, per se, that counts, but the access to the information it contains that will assure the use of genetic resources like DNA to the fullest – realizing the maximum benefit of DNA banks and their resources. DNA banking may be considered to be in a beginning phase as compared with traditional methods of collecting and storing plant genetic resources, but in order to work towards a standardized set of procedures and best practices, it would be very helpful to compile a list of world DNA collections, to which one could refer for information and comparison. The task would require first defining what a “DNA collection” is and a “DNA bank”, considering whether functions include DNA storage only or also hosting and sharing DNA. A DNA collection could exist in many modern laboratories that engage in genetic and genomic research, and they could exchange material samples among collaborators in similar projects. Other DNA collections might consider exchanging resources outside a close circle of collaborators. A DNA bank might host DNA samples from other laboratories and organizations, and it should offer to share samples with clients at large. Starting a list of collections should take these considerations into account. Once the criteria are clear, this list could focus first on official DNA collections linked to national collections of plant genetic resources (for example, those belonging to a national genebank, or those adjunct to botanical gardens and herbaria) and it could then be expanded to accommodate DNA collections of genomic resources. Andersson MS, Fuquen EM, de Vicente MC. 2006. State of the art of DNA storage: results of a worldwide survey. In: de Vicente MC, Andersson MS, editors. DNA Banks—Providing Novel Options for Genebanks? Topical Reviews in Agricultural Biodiversity. International Plant Genetic Resources Institute, Rome. pp.6–10. Available online (accessed 31 October 2011): http://cropgenebank.sgrp.cgiar.org/images/file/learning_space/dna_banks.pdf. de Vicente MC, Andersson MS, editors. 2006. DNA Banks—Providing Novel Options for Genebanks? Topical Reviews in Agricultural Biodiversity. International Plant Genetic Resources Institute, Rome. Available online (accessed 31 October 2011): http://cropgenebank.sgrp.cgiar.org/images/file/learning_space/dna_banks.pdf. Ebert AW, Karihaloo JL, Ferreira ME. 2006. Opportunities, limitations and needs for DNA banks. In: de Vicente MC, Andersson MS, editors. DNA Banks—Providing Novel Options for Genebanks? Topical Reviews in Agricultural Biodiversity. International Plant Genetic Resources Institute, Rome. pp.61–68. Available online (accessed 31 October 2011): http://cropgenebank.sgrp.cgiar.org/images/file/learning_space/dna_banks.pdf. Gemeinholzer B, Rey I, Weising K, Grundmann M, Muellner AN, Zetzsche H, Droege G, Seberg O, Petersen G, Rawson DM, Weigt LA. 2010. Organizing specimen and tissue preservation in the field for subsequent molecular analyses. In: Eymann J, Degreef J, Häuser C, Monje JC, Samyn Y, VandenSpiegel D, editors. ABC-Taxa, Volume 8. Manual on Field Recording Techniques and Protocols for All Taxa Biodiversity Inventories, Chapter 7. pp.129–157. Graner A, Andersson MS, de Vicente MC. 2006. A model for DNA banking to enhance the management, distribution and use of ex situ stored PGR. In: de Vicente MC, Andersson MS, editors. DNA Banks—Providing Novel Options for Genebanks? Topical Reviews in Agricultural Biodiversity. International Plant Genetic Resources Institute, Rome. pp.69–76. Available online (accessed 31 October 2011): http://cropgenebank.sgrp.cgiar.org/images/file/learning_space/dna_banks.pdf. Hodkinson TR, Waldren S, Parnell JAN, Kelleher CT, Salamin K, Salamin N. 2007. DNA banking for plant breeding, biotechnology and biodiversity evaluation. Journal of Plant Research 120:17–29. Available online (accessed 31 October 2011): www.scribd.com/doc/45316957/DNA-Banking-for-Plant-Breeding. Walters C, Hanner R. 2006. Platforms for DNA banking. In: de Vicente MC, Andersson MS, editors. DNA Banks—Providing Novel Options for Genebanks? Topical Reviews in Agricultural Biodiversity. International Plant Genetic Resources Institute, Rome. pp.25–35. Available online (accessed 31 October 2011): http://cropgenebank.sgrp.cgiar.org/images/file/learning_space/dna_banks.pdf.